Last week, we looked at the value tenets of Warren Buffett. We conclude the book by looking at Buffett's views on portfolio management and the psychology of money as reported by Hagstrom. Buffett says to become a “focus” investor. This means concentrating your investments in outstanding companies run by strong managers and holding on to these investments for 5 - 10 years at the bare minimum. Stop thinking in seconds, minutes, days or months, and shift to thinking about years and decades. Sell infrequently, as this reduces transaction costs and increases after-tax returns. Focus your investment on a few companies - 10 to 20, which you can truly understand. Any more and you are inviting trouble. Somewhat counterintuitively, diversification may increase risk if it causes you to invest in areas beyond your circle of competence, leading to investments you don’t fully understand. True investors are calm (know that stock prices will rebound so long as the fundamentals stay the same), patient (wait for the right opportunities and ignore the popular and overpriced stocks), and rational (approach the market with neither undue pessimism nor irrational optimism). Overcome the biases associated with investment by creating set rules and thresholds that you will adhere to. Only invest or divest of companies if certain predetermined rules are met. This will ensure that you behave rationally rather than fall into the institutional imperative of the investment community. In an amazing turn of events, Office Depot (ODP) has seen its stock drop by an incredible 97% in the last two years. At its current stock price barely above $1, investors are clearly treating this company as the next Circuity City. So is it? "The credit insurance issue is one that really came on the heels of the Circuit City announcement. A lot of the credit insurers are people like [Cosmiths], [Eurhermays], Atradius. They have reduced their exposure to retail in general and that has had some impact on us in Europe." The company has a debt to capital ratio above 70% (after including the effect of operating leases) while its income has been unable to cover interest charges for the last three quarters. Clearly, this does not represent a safe, value investment. But for those who like to take risks, this stock appears to have far too much pessimism built into it. The company's cash on hand represents half of its market cap! Its current ratio is almost 1.2, and most of its $600 million of long term debt does not come due until 2013. While the company will likely not show positive net income this year, management says it will achieve positive cash flow in 2009. (One source: it will spend only $150 million on capex, the bare maintenance minimum, versus $250 million in depreciation.) ODP also has the luxury of selling land until it can get its cost structure in line with its revenues. Clearly, Staples (SPLS) is dominating ODP in all profitability metrics. But does that mean ODP is worth nothing? It's certainly possible, but at $1/share, ODP's stock says its likely, suggesting risk tolerant investors have a lot of upside possibilities without having to bet a whole lot. LoJack shares (LOJN) rose nearly 20% last week as the company issued an EPS outlook for 2009 that would give it a forward P/E of 9. The company, which makes products to track stolen vehicles, also showed a small profit in Q4 of 2008, despite historic lows in the auto industry. While the quick run-up in the share price may have been difficult to predict, LoJack had all the makings of a stock with a lot of upside with little downside. LoJack fares well in this regard, with a cash position over $60 million and a total debt position under $30 million. This allows it to make strategic investments to expand and diversify its business with little in the way of competition. It will soon come out with a product that leverages its existing technology infrastructure to find cargo, as well as mentally ill patients who have wandered off. But all the liquid assets in the world won't help if a company is burning through its cash. But LoJack has a demonstrated ability to cut costs: despite the massive drop in auto sales, gross margin fell only 3 points from 53% to 50%. As we discussed, since the company farms out the manufacture of these units, these costs are mostly variable, which makes it easier to scale them down to accommodate a drop in sales. Furthermore, the company's fourth quarter modest profit demonstrates it is able to make these strategic investments while still maintaining its cash position! While LOJN shares are not as cheap as they once were, they nevertheless may still represent great value for those with a long-term outlook. Annualized sales in January of 2009 managed to out-bottom even even the worst of months over the last several decades! How can this be? Considering the major increases in both US population and US incomes between 1967 and today, this news is difficult to fathom. The easiest explanation is that the prevalent fear now gripping this economy is as bad as it has ever been in recent history. Indeed as we saw here when we looked at consumer confidence levels over time, people have rarely been so scared as they are now. But a careful look at the chart reveals that sales have actually been trending downward for some years now. While much of it can be explained by the high oil prices that pushed those on the margin to choose alternative methods of transportation, not all of it can be. 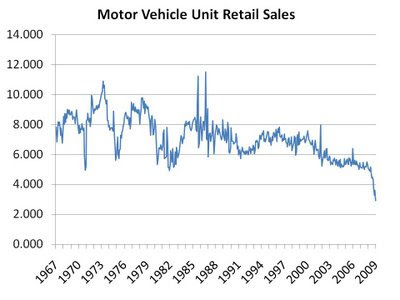 In fact, auto sales appear to have started trending down ever since the mid nineties, despite low oil prices in the ensuing decade! One additional explanation that might explain the apparent decade long slump is a change in quality of both automobile parts and service. Fierce foreign competition may have improved engine capabilities and therefore the mileage drivers have been willing to put on their cars before buying new ones. Furthermore, improvements in servicing and repairs may be allowing buyers extra time between vehicle purchases. Despite the fact that this suggested improvement in quality may continue to take a bite out of new car sales, it is clear that the recent catastrophic drop is the result of a cyclical downturn. Once money starts to flow again (thanks to both fiscal and monetary stimulus), annual car purchases will return to more sustainable levels. As value investors, we don't know when that will happen, but we look to buy companies that are financed to withstand long downturns and which trade at discounts to their intrinsic values due to the cyclical economic turmoil that currently persists. Individual investors don't have the money to buy expensive research reports about stocks in which they are interested. However, that doesn't mean investors have to start from scratch on each new investment idea either. Fortunately, there are many sources of information out there that attempt to provide free stock investment research. Before continuing, it should be stressed that even though the information out there can help individuals get a head start on researching potential investments, all investors are urged to do their homework by reading up on the company of interest themselves. The company's annual report (freely distributed by every public company, both in online and hard copy form) is the best place to start. The first place to find info is on the web sites that offer up-to-the-minute prices on stock tickers, as most of them also aggregate information from published news sources. For example Google Finance and Yahoo! Finance both carry a list of relevant articles for each stock for which they provide a ticker update. Often, however, these articles are written as news information for the general public, and don't provide the kind of analysis that investors require. For more in-depth analysis, investors with online brokerage accounts often have access to the research reports issued by their broker firms. This can also serve as a source of useful information about various companies. Unfortunately, many companies in which investors are interested will not be covered by their brokerage firms, particularly for investors who are affiliated with a small broker. For more in-depth analysis, there are sites out there that aggregate information across the web and thus include info from blogs, news media, research websites, conference calls, and press releases. Seeking Alpha is one of my favourites in this area, as it has a plethora of contributors that regularly assess a multitude of companies. The problem here is that the articles are not necessarily coming from a trusted source, and therefore extra scrutiny is required on the part of the investor. That brings us to the sites out there that allow users to filter content by voting up good articles and voting down others. Value Investing News is a great site for those looking for articles that have gotten the approval of readers. This particular site focuses on stocks from a value investing point of view. Any attempt I might have made to include all quality sites that cater to investors looking for research could not possibly have been a complete one; therefore, I have only included some of my favourites. If you have any other sites that you find useful for whatever reason, feel free to share it by commenting on this post. In this part, we consider the value tenets of Warren Buffett as per Robert Hagstrom. This is where you determine whether the company is a good value and should be purchased. This is where John Burr Williams’ DCF model comes into play. You take the Owner Earnings (determined above) expected over the life of the business (often you go out a number of years, and then say beyond this, we expect this constant rate of growth), and then discount by an appropriate interest rate (Buffett uses the long-term government bond rate, or 10%, whichever is higher). Once you have a value for the company using the DCF, you consider how the company is currently valued by the market and see if there is a sufficient margin of safety in which to buy. The business tenets help keep you focused on companies that are relatively predictable. The management tenets help keep you focused on companies that are well run. These combined give you a good idea of the company’s future earnings potential. The financial tenets reveal the numbers you need to make a determination of the intrinsic value. The value tenets help you calculate intrinsic value and determine if this is a good buy. In the next part, I will review Buffett’s approach to portfolio management and the psychology of money! When a great number of jobs are lost, as they often are during recessions, the public often cries out for protectionist measures (i.e. "Buy American") in order to keep more money inside the country. Unfortunately, policies encouraging such behaviour force individuals and businesses to buy more expensive goods/services than they otherwise would, resulting in further losses. Furthermore, when one country decides to implement such measures, other countries retaliate with their own protectionist policies, resulting in a race to the bottom which increases costs (everyone must pay more for their goods) at a time when profits are already under pressure. Notice a spike in 1930 with the passage of the Smoot-Hawley Act, a protectionist measure that economists credit with deepening the Great Depression. Trading partners of the US retaliated with protectionist measures of their own and it didn't help matters. In the mid-1930s Congress began to relax protectionist laws, and the next decade saw several notable bi-lateral trade agreements that were the impetus for the strong economic growth that followed. Since the year 2000, tariffs have continued to fall as more and more governments have recognized that economic studies continue to show that trade benefits both partners. However, the latest US stimulus bill risks going against the spirit of free trade. As jobs in certain industries are being lost and special interest groups (those that are hurt in the short-term by the flight of jobs) clamour for protectionist measures, it's important that the government, and its constituents, the voters, pay attention to history by noting that free trade has helped us achieve the level of wealth which we are at now, and more trade, not less, will help get us out of this cyclical downturn. Last week, LCA Vision (LCAV) reported results for its fourth quarter ending Dec 31, 2008. Demand for its LASIK eye procedure dropped a staggering 50% from one year ago. However, this should not come as a big surprise, since we saw earlier that demand for this surgery is highly correlated to indexes of consumer confidence, which are currently running at about half of what they were last year. We can only guess as to when the economy will return to its full potential. Therefore, what makes LCAV appealing for value investors is its strong financial position. While its chief competitor TLC Vision (TLCV) flirts with bankruptcy and a 15 cent/share stock price, LCAV holds $56 million in cash compared to debt obligations of just $21 million. While LCAV's cash position suggests it has some breathing room, it means little if the company is losing cash hand over first: the company lost $8 million in its fourth quarter, suggesting the cash could get depleted quickly. Therefore, it's important to get a good read on how well LCAV is able to reduce its costs. 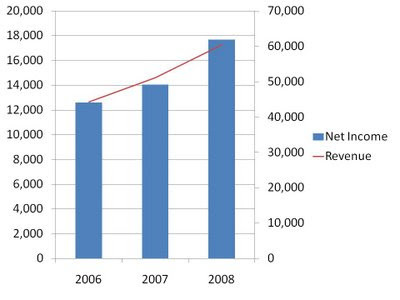 Reading the company's results reveals that LCAV has cut costs such that its break-even rate for 2009 is 110,000 surgeries, down from 170,000 in 2007. 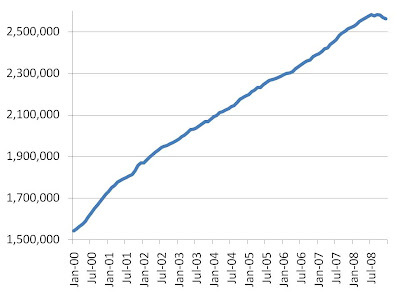 The number of procedures performed in 2008 was 115,000. While profits for the next several months are not likely to break the bank, LCAV offers investors with long-term horizons the opportunity to buy a company with enormous future profit potential at a cheap price. The company is safe (from a cost point of view and due to its cash position) but trades at a market cap of only $64 million, but averaged net income of $30 million per year for the four years ending in 2007. But perhaps the most bullish indicator for this company is its improved marketing efficiencies. Late in 2008, the company experimented with a marketing approach that yielded a 30%+ increase in demand. The company also reported that January 2009 procedures (not included in the 4th quarter results) were up 48% from December, compared to a 14% increase year over year. While investors should not expect enormous profits right away, they can take advantage of a stock price that may have been unjustifiably hammered from a peak of $45 to its current share price of $3. The drop in debt in late 2008 doesn't seem like much compared to the run-up that preceded it. This is why many believe this recession will be a long and protracted one, with consumer debt having a long way to go before it returns to a more sustainable level: instead of spending on gadgets, consumers use their money to pay off debt, which reduces demand and thus lowers output (GDP). On the other hand, however, lower interest rates (thanks to the Fed) make it easier for consumers to pay off debt and still have money left over. Furthermore, the drop in commodity prices (including gas prices) should also help ease the strains on consumers as we saw here. Finally, when consumers pay off debt, it induces the lender to take on a new customer. While this multiplier process is not as quick or as high as it is for consumer spending, it results in increased investment (at the expense of consumer spending) due to cheaper capital which, according to economists, leads to stronger, sustainable, long-term growth, despite the short-term pain. Last week, we took a look at how investors can determine how much money the companies they own have been spending in order to lobby the government. While companies must also disclose the specific bills and the government departments on which they have spent money, this does little in the way of informing investors as to the returns on investment that lobbying efforts have ceded. A reader of last week's post pointed out that financial returns have been shown to correlate with lobbying efforts. Indeed, a paper by Chen, Parsley and Yang (2008) from just a few months ago attempts to illustrate this correlation (the full text of the paper is available here). The authors examine lobbying expenditures in a similar manner to those of R&D: while they are classified as current accounting expenses, they may be expected to yield future profits. Using regression analysis, the authors concluded that firms with higher lobbying expenses do show higher income and cash flow. So does this mean you should look for the companies that spend the most on lobbying and buy their stocks? Not quite. First of all, while the expected value of income may be higher for firms that lobby more, this doesn't mean all high-lobby firms will perform better. There is variability in the returns which is explained by other factors unrelated to lobbying, so you still have to do your research! Secondly, there is a possible flaw in the cause and effect relationship between income and lobbying. It could very well be that firms that see an impending increase in net income are looser with the purse strings (more company trips to Vegas, more unneeded hiring, and more lobbying). Thirdly, there could be self-selection bias at work here, where firms who do lobby (and who thus subsequently enjoy the returns) do so because they see an opportunity to do so, while firms who don't lobby may not do so because they foresee that their efforts will be fruitless. Finally, a company which lobbies is also more likely to be committing fraud. A paper by Yu and Yu (2006) found that fraudulent firms spend 77% more on lobbying than firms which do not. According to the paper, this lobbying for fraudulent companies buys them an average 117 more days before they get caught, but probably isn't the type of investment shareholders are looking for! Rationality is determined by the manner in which management allocates the company’s capital. Buffett says it is highly irrational for a company to retain earnings for investment in projects which return below-average rates for the company, as this destroys shareholder value. This kind of behaviour will catch up with the company in the form of lower long-term market values. Companies should only retain excess cash and reinvest internally where doing so produces a higher return that the cost of capital. Look for managers that are rational in their asset allocation. Managers that provide the least amount of information as required by securities law and GAAP are not being candid, and provide very little opportunity to analyze the company. Look for managers that admit their mistakes just as readily as they trumpet their successes. Buffett’s theory is that managers who confess their mistakes publicly (as Buffett does in his annual reports) are more likely to correct them. Those that mislead the public are likely to mislead themselves in private. You want honest managers who provide lots of information useful for analyzing the company. The institutional imperative is “the lemminglike tendency of corporate management to imitate the behaviour of other managers, no matter how silly or irrational that behaviour may be.” It is human nature to want to follow the group, because it is much easier to blame someone for failure associated with contrarian behaviour than failure associated with group behaviour. Watch out for managers who follow the institutional imperative in buying companies that make little sense, as this kind of empire building almost invariably destroys shareholder wealth. In the first part of this review, we looked at the key influences on Warren Buffett’s investing philosophy. Now, we will look at the 12 tenets of the Warren Buffett Way, starting with the business tenets. Buffett believes in investing in companies within your “circle of competence.” When you invest outside this circle, you risk not understanding the business. When you don’t understand the business, you can’t understand what drives its success and what threatens it with failure. You must be convinced that the business you are buying will perform well over time, and this is the only way to be convinced of this. Buffett buys businesses for the long run. Because no one can predict the future, he uses historical performance as a reasonable proxy for the future. If the company has been able to weather storms in the past and perform consistently in different operating environments, then it will likely continue to do so in the future. Stay away from companies that have not been consistent in the past and are in the midst of changing strategic direction, as this removes your ability to be confident in the company’s future. Favourable long-term prospects depend on the company’s long-term competitive advantage. Buffett calls this the “moat” which “franchise” businesses have. You are looking for companies with products or services that (1) are needed or highly desired, (2) have no close substitute and (3) are not regulated. You might also want to consider how the company stacks up to Porter’s Five Forces, which help determine its level of market power. The bigger the company’s moat, the more sustainable its franchise. To illustrate this point, it is necessary to consider UTS stock's recent trading history. The share price mostly traded between 80 and 90 cents per share in the four months leading up to the end of January 2009. At the end of January, an offer was made at $1.30 per share. The market reacted, however, by bidding up the shares to $1.75, presumably in the belief that the assets of this company warrant a take-out price higher than what is offered in this initial bid. But only after this catalyst (the initial offer) did the market move UTS' share price to what it believes to be a fair price for control of this company. And this new share price represents a 100% premium to the original price. In other words, those who understood the market value of the assets could have bought in before the first offer was made, but they did not. When value investors see a disparity between what a company is worth and what it trades at, they need not necessarily wait for a catalyst event. With a diversified portfolio of stocks that trade at substantial discounts to what they are worth, the investor is putting himself in a position to capitalize with the largest magnitude of returns if and when the company's assets do become recognized. Indeed, the investor who thought the value to be $1.75 when the stock traded at 80 cents has seen a gain of over 100%, while those who waited for the catalyst saw minimal gains as the stock price reacted almost instantly the day of the bid. While the tenet that the market is very short-term in its thinking can be applied to find value in many a stock, that is not necessarily the case for UTS, as we'll see when we discuss the second market property which is evident with respect to this company's recent events. Across a number of value metrics, Whirlpool (WHR) looks like a bargain. This manufacturer of home appliances creates products under several brands including Maytag, KitchenAid and Gladiator, along with its flagship Whirlpool brand. The stock currently trades at just $34, despite the fact that the company brought in $7.50/share in operating profits in a tough 2008. Despite poor economic expectations for 2009, the company expects cost cutting and productivity initiatives to result in an EPS of $3 to $4 per share, and free cash flow generation on the order of $4.10 to $5.50/share. Unfortunately, these typical metrics hide a significant liability: WHR's pension obligations. With the company's market cap at $2.5 billion, these represent significant liabilities indeed. While the company's debt to equity (including operating leases as we've discussed here) of 100% is a bit on the high side, it is perhaps acceptable considering Whirlpool's proven ability to weather storms and produce profits through downturns. However, combining this debt load of about $3 billion with postretirement obligations valued at over $2.3 billion results in a long line of claims to the company's profits ahead of shareholders. That's not to say WHR doesn't represent good value at this price. However, in any valuation these retirement obligations must be factored in. This represents another reason as to why a careful reading of the financial statements is of utmost importance before investing in a stock. The simple P/E, EPS, P/B metrics are not enough. Change the "Search Field" drop-down to "Registrant Name"
Enter a company name under "Criteria" e.g. "Pfizer"
You will see either the quarterly of half-year documents your company was required to submit. A quick look at Pfizer's Q4 2008 disclosure document reveals it spent $3.25 million lobbying last quarter! You will also see the various government groups it has lobbied (e.g. Health Departments, US Patent Office, State Department, etc) as well as the subject matter on which it has lobbied (e.g. an intellectual property act, some WTO issues etc). Should lobbying be allowed? That discussion is outside the scope of this article. On the one hand, lobbyists may alert otherwise ignorant government officials as to the impact of various legislation on their constituents. On the other hand, it gives a legislative advantage to those who have the means to directly influence government officials. If shareholders believe managers are being wasteful by slapping needless lobbying expenses, they are free to sell their shares. Thanks to the "Lobbying Disclosure Act" of 1995, shareholders have much of the info they need to make that decision. Individuals are always looking for the best places to store their savings in order to achieve the best long-term rate of return. Unfortunately, the path to finding the "Next Buffett" is littered with false promises and even fraud. The exposure of the Madoff fund reminded investors that unscrupulous managers will seek to rob them (all the while lying publicly about it). But investors must also look out for managers who are actually honest, but nevertheless inept! Consider the Beardstown Ladies. In 1983, a group of 13 old ladies formed an investment club in order to help manage their savings. Their 'success' led to the publishing of a best-seller "The Beardstown Ladies' Common Sense Investing Guide" in 1994 where it was claimed that investment returns had approximated 23% per annum since inception! In 1998, however, third-party auditor Price Waterhouse found the return over that period was actually 9.1%, well below the 14.7% posted by the S&P 500 during the same time period! No fraud had appeared to take place; the ladies had simply erred in counting returns by including new money invested as investment income! The group was exposed for what it was: just one of the many investment clubs around that had underperformed the market. The ladies certainly took advantage of their brief moment as star investors in the public eye, however. The ladies made a video, authored five books, and went traveling on a media bonanza, drawing the interest of investors near and far. But investors looking to learn how to improve their returns were unfortunately misled. For more on the details of how the truth was uncovered, see this article. Whereas Graham’s influence was quantitative in nature, Fisher’s was qualitative. Fisher taught Buffett two things: Invest in companies with above-average potential, and align yourself with the most capable management. Each of these now form core principles of Buffett’s investment philosophy. In assessing above-average potential, Fisher meant to look for the ability to grow sales at a rate greater than the industry average while maintaining consistent (or growing!) profit margins. The previous two teachers gave Buffett the skills necessary to determine if the company was something he wanted to buy. Williams gave Buffett the tool to assess the intrinsic values of the companies he wants to buy. That tool is the Discounted Cash Flow (DCF) Model, and Williams developed it in his PhD thesis, The Theory of Investment Value. The basis for the DCF model is that you can find what a security is worth today by estimating all the cash the company will earn over its lifetime and then discount that back to the present value and determine it on a per-share basis. As Buffett says, “Just like a cow for her milk, or a hen for her eggs, so is a company for its earnings”. Never forget that a share is a mere representation of a company, and you are buying the company rather than a share. On a technical note, Buffett uses the long-term (10 year) US bond rate as his discount rate. Where this rate is very low, Buffett uses 10%. He uses the risk-free government rate because he believes the risk is covered in the transaction itself (by factoring in the margin of safety). Munger is the Vice-Chairman of Berkshire Hathaway. He was a successful investor in his own right prior to associating with Buffett, generating compound annual returns of 19.8% from 1962-75 vs. 5% for the Dow. His long-standing friendship and work association with Buffett has had a profound effect on Buffett, as evidenced by the number of times Buffett writes “Charlie and I” in the Berkshire annual reports. Munger’s greatest contribution is perhaps helping Buffett get away from a strict value philosophy to consider those companies that don’t perfectly fit Graham’s quantitative rules. He taught “it is far better to buy a wonderful company at a fair price than a fair company at a wonderful price”, which is precisely the case in some of Berkshire’s greatest investments. Many companies offer pension funds to employees as a tool for attracting and retaining workers. Some of these pension funds are called "Defined Contribution" plans, since the employer and/or employee kick in a defined amount into an account every period, and the employee owns whatever is in that account when he leaves. The other type of pension fund is called a "Defined Benefit" plan. When it's the benefit that's fixed (or defined), rather than the contribution, the shareholders are on the hook for a set benefit when the employee retires, no matter what happens between now and then. As one may imagine, "Defined Benefit" plans are more risky for shareholders. If returns on the plan's assets are strong, shareholders make money. In a time like this, however, assets in pension plans are taking a plunge, and shareholders are on the hook to make up the difference. Consider CN Rail (CNR). In last year's annual report, CNR disclosed that it held $16 billion in assets specifically to pay for its obligations under its "Defined Benefit" pension plan. Since then, the S&P 500 is down almost 50%. CNR also disclosed that it aims to hold 53% of plan assets in equities, suggesting that its pension plan will have dropped by $4 billion in the last year by considering the equity drop alone (i.e. ignoring real-estate and other components of the plan assets). While some investors may believe the market will rebound by the time these obligations have to be paid, others may have a more dire outlook and believe this to be a permanent loss. Whatever the investor's position may be, it is important that he understands and is aware of any pension obligations a company may have. For CNR, this $4 billion swing represents 20% of the company's current market cap, making it no small point. Earlier, we discussed some of the quantitative listing requirements of the NYSE. But this list is not even close to comprehensive. Not only do the major exchanges have long lists of requirements unrelated to company size and trading volume, but many of them also reserve the right to deny any issuer a listing for no specifically listed reason. Consider Image Sensing Systems (ISNS). One relatively recent requirement of the NASDAQ requires that each company's audit committee have three independent directors. ISNS was just meeting this requirement before the untimely death of board member Richard Magnuson. Only four days after Magnuson's death, the company received a letter from the NASDAQ informing it that it no longer meets its listing requirements! Now the company will be de-listed unless it acts fairly quickly. The good news for investors is that they don't have to worry about checking out each company's individual corporate governance structures when they are listed on a major exchange. In some cases, however, these requirements may not go far enough. Therefore, investors must still investigate issues which are not covered by these minimum requirements. Interestingly enough, when it comes to employees, the Lehman Brothers bankruptcy is not the runaway bankruptcy by historical standards that it appears to be if only judged by assets. 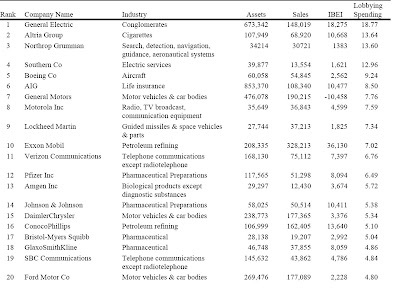 The largest bankruptcy by employee is actually K-Mart at 250,000, but it doesn't even make the top 10 list by assets so it doesn't show up in the chart above. The most recent large bankruptcy is that of Circuit City, at around 35,000 employees; this represents more employees than Lehman Brothers, but Circuit City will go down with far less fanfare. So which measure is the one on which bankruptcies should be judged? The answer is both. When companies with large numbers of employees go down, it has a large direct effect on employment. When companies with large amounts of assets are wiped out, it results in large amounts of capital being wiped out, which affects the workers of stakeholders indirectly. It makes a lot of sense that the aggregate value of a country's stock market should be correlated with its Gross National Product (GNP). Assuming the stock market contains most of the country's largest companies, the value of what those companies produce should constitute a large part of GNP and should also play a large role in determining what those companies are worth, hence the suggested correlation. In this 2001 article, Buffett argues that while "the [stock market value to GNP] ratio has certain limitations in telling you what you need to know...it is probably the best single measure of where valuations stand at any given moment." What we see from the above chart is that stocks now have come down to a more normal historical value, after years of outperforming GNP! Indeed, even after the tech bubble burst, stocks were still expensive, and only after another bull market to 2007 did they come 'crashing' down to today's seemingly normal levels. Of course, relying completely on this chart could lead one astray. As the market has become more sophisticated over the decades, there may now be a greater percentage of companies that are public, which would lead to an upward trend to this chart rather than a horizontal line. Public sentiment during certain periods may have also resulted in a skewed public to private comany ratio. For example, if we look back at the years during the Great Depression, it is likely that many companies, even many successful ones, remained private for lack of cheap public capital. Nevertheless, this chart is immediately useful for demonstrating that over the last several years, stocks are clearly trading at a discount to what they were after even after accounting for a drop in the value of goods produced. On my quest to learn more about Value Investing, several people have recommended that I read Robert Hagstrom’s The Warren Buffett Way. I recently had an opportunity to do so, and found it to be an excellent book that takes Benjamin Graham’s The Intelligent Investor one step further in its application to Warren Buffett’s methodology. If you're interested in a chapter-by-chapter review of this book, Reyer has done so here. How Did Warren Buffett Become So Successful? Benjamin Graham was Warren Buffett’s professor at Columbia University, and the author of The Intelligent Investor, which introduced the value investing philosophy. He taught Buffett the difference between investing and speculating (Investing is an operation which, upon thorough analysis, promises safety of principal and a satisfactory return) and the importance of building a margin of safety (which is really the core idea of value investing). The Margin of Safety is the difference between what you pay for company and its intrinsic value. The less you pay, the greater the margin of safety, and the greater the company’s ability to withstand negative events. Because of the reversion to the mean, the company’s value is likely to increase to its intrinsic value. The Margin of Safety can be increased by looking for companies selling at low prices relative to net current assets and low prices relative to earnings. Graham’s influence on Buffett is that he taught Buffett the essential quantitative elements of value investing. What is the outlook for pricing for the company’s products? Can it raise prices? Consider Porter’s Five Forces. Can the company sell more? What is the outlook for units? Will it have to decrease prices to sell more units? Can the company increase profits on existing sales? What is the outlook for the gross profit margin? Do they have any control over their basic costs (no company has control over fuel or commodities!)? Does the company have unprofitable operations that it can shed? What happens to the calculations above if these operations were shed? How does the company think it will do compared to the market’s estimates? How has it performed in the past based on its own estimates? How much can the company grow in the next 5 years, and how will this growth be achieved? What will thec ompany do with excess cash? If re-invested, will it earn a return to justify the reinvestment or should it have been distributing as dividends? What do you expect its competitors to do? How does this company compare financially to its competitors? This was a great book, and I would highly recommend the series. John Thain took the reigns as CEO of Merrill Lynch less than one year ago. He oversaw the company as its stock dropped nearly 70% and a deal was eventually struck to sell the company to Bank of America. Thain lobbied for a $10 million bonus following the takeover, but withdrew his request when there was a public outcry. Then, when the media sensationalized his office purchases, Thain reported that he would pay the firm back for the excessive purchases which "shouldn't have been made". Smart move, lest he be vilified like his fellow former CEO Richard Fuld, whom we discussed here. If attracting intelligent CEOs requires allowing these types of expenses, maybe it's in the best interests of shareholders to allow this to take place: they are desperate for a manager that can pull them out of this mess. But on the other hand, it seems paradoxical that a competent management would see it fit to spend over $1400 on a garbage can, whether the company is tanking or not. Spending of this nature would make our friends at Early Retirement Extreme cringe! Last week, Microsoft (MSFT) reported quarterly earnings not that different from those of one year ago. Revenue was up 2%, while operating income was down 8%. MSFT decided to cut 5,000 jobs, and announced a large expected drop in operating expenses in the next six months. So from a profit point of view, things aren't too different from what they were one year ago. The stock, however, trades at about half of what it did one year ago. Does this represent a buying opportunity? A quick look at MSFT stock reveals a characteristic fairly unique to Microsoft as compared to its peers of similar market cap: its large cash position. Microsoft carries far more cash ($21 billion) than it does debt ($2 billion)! When one subtracts this net cash position from MSFT's market cap, one is left with a $134 billion company with no debt. MSFT hasn't traded at this price in 10 years, despite gigantic profit growth in that time. The sale currently taking place in the stock market is incredible!